The format for this book is quite simple. 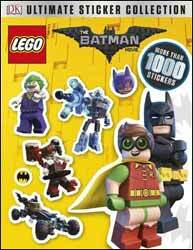 There are colourful pages with silhouettes which give clues to what stickers should be placed there. Then, it's simply a case of going through the sticker pages, finding the corresponding sticker and sticking it over the silhouette. Some are easy to find, whilst others require you to find several stickers to make a sort of jigsaw puzzle that results in a much bigger image. The pages (not to mention the stickers) are glossy and hardwearing. There are over 1000 stickers. The ones for the designated pages make up the minority, with "extra stickers" taking up the bulk of the sticker pages. These extra stickers represent a cross between duplicates of all of the designated page stickers, and tiny square stickers which depict images from the movie and symbols. These tiny stickers number 160 to the page (and there are four pages of them). There are plenty of fun facts dotted about the pages, as well as a handful of double page scenes which allow you to use the extra stickers to create your own story. It's a great book that should keep anyone quiet for many hours.